Capital Rotary members put in a solid hour of community service Feb. 21 when they volunteered at Harvest Hope Food Bank’s Shop Road headquarters in Columbia. 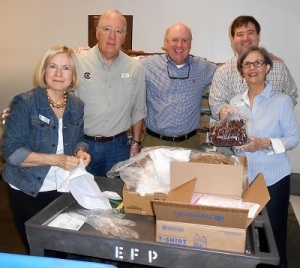 Rotarians sorted and stocked 1,363 pounds of bakery items; bagged 611 pounds of snacks and 1,714 pounds of produce; and bagged and stocked 443 pounds of dairy goods – all destined for the Emergency Food Pantry. Harvest Hope, begun in 1981, works to meet the needs of hungry people in 20 counties in the Midlands, Pee Dee and Greater Greenville regions of South Carolina. 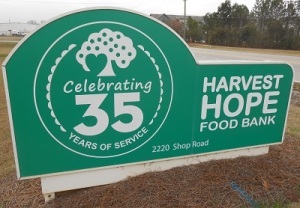 Food Bank executive director Denise Holland is a Capital Rotary member. 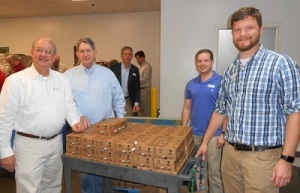 In photo at top right below, the work detail includes club members (from left) Chris Ray, Jay von Kolnitz, Paul Gillam, Austin McVay and John Guignard. In photo at bottom right below, club members on work detail are (from left) Ione Cockrell, Trey Boone, Frank Rutkowski, Ben Carlton and Ann Elliott.